During the fall of 2011 Margaret Anne Goldsmith, a descendant of the first four Jewish families to settle in Huntsville, Alabama, donated her collection of family heirlooms to the National Museum of American Jewish History in Philadelphia (NMAJH). A number of these artifacts are now being exhibited in the Museum’s core exhibition. The Museum was especially interested in Margaret Anne’s collection since the story it tells provides a meaningful counterpoint to the more well-known stories of the Jewish communities in large northern cities. In honor of the exhibit, and in honor of Margaret Anne’s past history as a board member of The Museum of the Southern Jewish Experience (the pre-cursor to the Institute of Southern Jewish Life), we wanted to feature her story here. So we reached out and asked Margaret Anne questions about her collection at the NMAJH and her identity as a Southerner and a Jewish woman. Tell us a little bit about your family – when did they come to this country, from where, and where did they settle…? My ancestors were all German Jewish immigrants, members of four families who settled in Huntsville, Alabama before and following the Civil War. The Bernstein, Herstein and Schiffman families arrived during the 1850s, and Oscar Goldsmith arrived in 1879. Subsequent generations united these four families in marriage. Members of the extended family have figured in every phase of the history of Huntsville, both economically and socially; from the agrarian years of the nineteenth century through Huntsville’s growth after World War II, to becoming known as Rocket City USA; and socially, from the time of institutionalized slavery before the Civil War to segregation followed by the civil rights era. The collection consists of well over a thousand items, and includes portraits of my ancestors, silver, china, textiles, furniture, jewelry, photographs, letters, documents, books, business ephemera, and other artifacts ranging from several slave receipts, a candelabra, and a grandfather clock, as well as my grandmother’s circa 1908 wedding dress, shaving mugs and even a poker set that belonged to my great grandfather, Oscar Goldsmith. What do you think is the most fascinating or telling item from the collection? 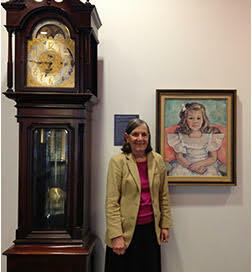 The most fascinating item in the collection is a grandfather clock that has belonged to our family for generations. It was purchased by my great great uncle and his wife, Bertha and Solomon Schiffman. When my parents had it appraised in 1975, the appraiser valued it at $5,000 and described it as follows: “Grandfather clock… deep with mahogany case, three weight movement and Westminster chimes. Silvered dial with applied gold numerals and pierced scrolling on corners. Moon dial and calendar by Elliott, London. Frank Herschede, Cincinnati label.” The clock is in excellent condition and keeps perfect time. Over the years it was moved from one relative’s house to another. Its most interesting move was to the Russel Erskine Hotel, a grand hotel built by a group of investors led by my grandfather, Lawrence B. Goldsmith, Sr. The Hotel opened in January 1930 and managed to remain open through the depression and continued in operation until 1973. During that period, from its vantage point in the Russel Erskine Hotel lobby, the clock watched Huntsville grow from a small farming and mill town to the space age when Huntsville became known as “Rocket City USA.” Over the years the clock witnessed a parade of important people as well as business men, snow birds from the northeast and Huntsville locals who entertained, conducted business and attended meetings. In addition, nationally known hotel patrons included movie stars, native daughter Tallulah Bankhead, senators, congressmen and army brass, the entire entourage of the Barnum and Bailey Circus every autumn, and most important, the German Scientist team led by Werner Von Braun. I inherited the clock when my father passed away in 1995, and kept it until 2011 when my children and I decided to donate it to the National Museum of American Jewish History along with the Bernstein, Herstein, Schiffman and Goldsmith Collection of archives and artifacts. We felt that the Museum would be a wonderful place for such a grand clock where it could be viewed by future generations. Why do you think that preserving Southern Jewish history matters? I think it’s important that people all over the country know more about the total Southern Jewish experience. Some people think that the Jewish experience in the South was a negative one, involving the Klu Klux Klan, the experiences of young Jews who came to the south during the Civil Rights Movement and the Leo Frank case. To most people, those were the experiences of Jews in the south. However, those events don’t paint the complete picture. Jews were welcomed in the South from the very beginning. When the early peddlers came, they were invited into their customers’ homes. From my own family’s experience, we were most welcome and were able to quickly blend into the larger Huntsville community. My two great-great-grandfathers served on the board of the city’s main bank. One great great grandfather was Treasurer of City Government during Reconstruction. Each generation was philanthropic and participated in the larger Huntsville community. It was our home; preserving those realities of Southern Jewish history matters to me. What is your favorite “Southern and Jewish” tradition or memory? My favorite Jewish tradition has to do with names — that is, Jewish names in the South: The tradition of Jewish naming over the years had become more Southern than Jewish. (I.e. lots of “Jrs,” III, IV, and not many Hebrew names, etc.) However, we are seeing the tide turn with naming of Jewish babies in the South becoming more Jewish. For example, my ten grandchildren all have biblical Jewish names. Thanks, Margaret Anne, for your commitment to preserving and sharing Southern Jewish history! Jewish food, holidays, Torah, Shabbat, history, blogs and more in your inbox – sign up now!